Spike is a smart laser measurement solution for AEC professionals that allows users to capture measurements and location of an object, such as a house or building, all from a photo. From that photo you can capture real time measurements including height, width, area, length and target location. The Spike device, Spike mobile app and Spike Cloud work together with your smartphone or tablet to change the way measurements are taken and shared. Details about the Spike device and how to purchase the device can be found at ikegps.com/spike-for-autocad/. Spike Cloud users can take advantage of Spike’s Photo Measurements as part of their day-to-day design work with Autodesk® AutoCAD®. Simply take photos of a project site using the Spike device or mobile app and a smartphone or tablet. Once photos have been captured, the user then exports a Spike Scaled Image, which is a scaled 1:1 and perspective corrected image, directly into AutoCAD where they are able to immediately measure and design using AutoCAD native tools. What used to sometimes take days to measure a project to be ready for AutoCAD import can now happen within hours, all from a smartphone. 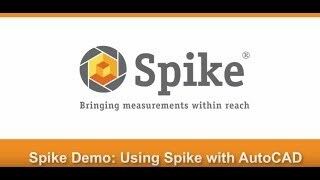 - Spike gives you the flexibility to measure when and how you want, whether in the field or at the office, using the Spike mobile app or cloud-based tools. - The Spike device pairs with your smartphone or tablet via Bluetooth. Spike’s laser rangefinder works with the camera, GPS, compass and internet connection of your smartphone or tablet. - The accuracy of Spike’s laser rangefinder is ± 5cm (2in); the accuracy of Photo Measurements is ± 1%; and the accuracy of Point-to-Point Measurements is ± 3%.